Book companions are great for your guided reading lesson plans, and even better if you need an emergency substitute plan that is print-and-go ready! 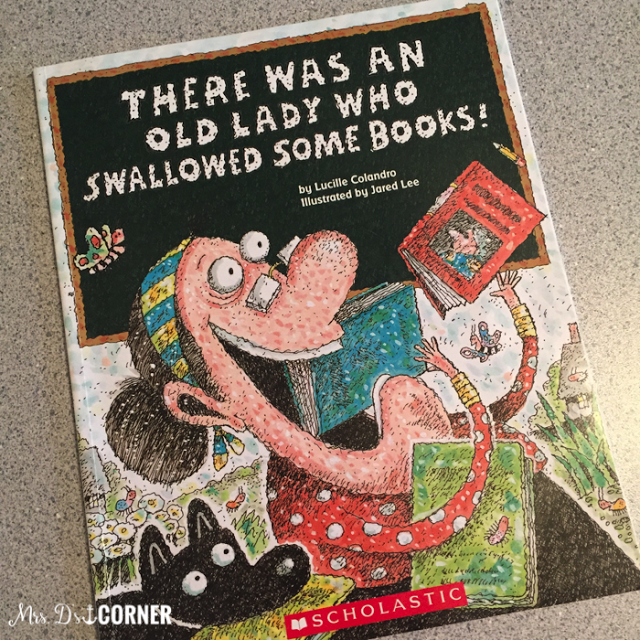 Today we are going to talk about how to use the story There Was An Old Lady Who Swallowed Some Books! in your special ed classroom. Welcome to the first month of Books Bloggers Love, a monthly link-up between 12 teacher bloggers! Each of us will be sharing our favorite book to read for the upcoming month, share with you how we use it, and you might find a freebie or two. 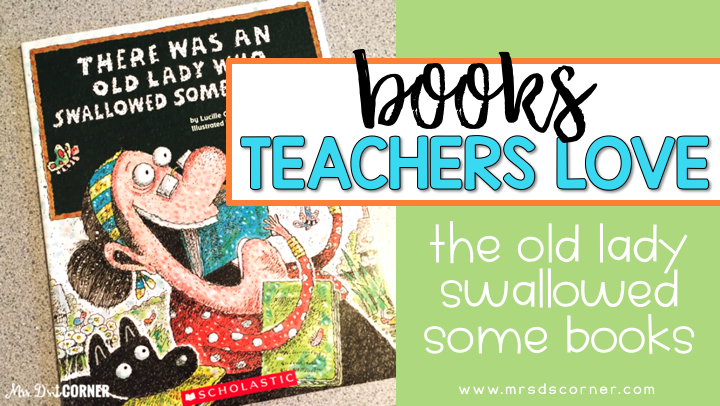 Since August is back to school month for a lot of us, I chose a book that is perfect for the month of August: There was an Old Lady who Swallowed Some Books! 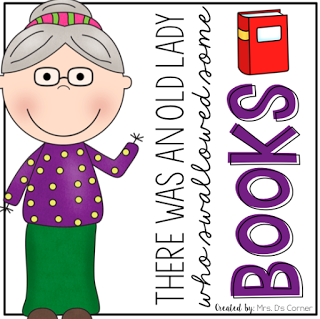 My kids love the “There was an Old Lady…” books almost as much as I do. They are perfect because of how repetitive, yet silly they are. 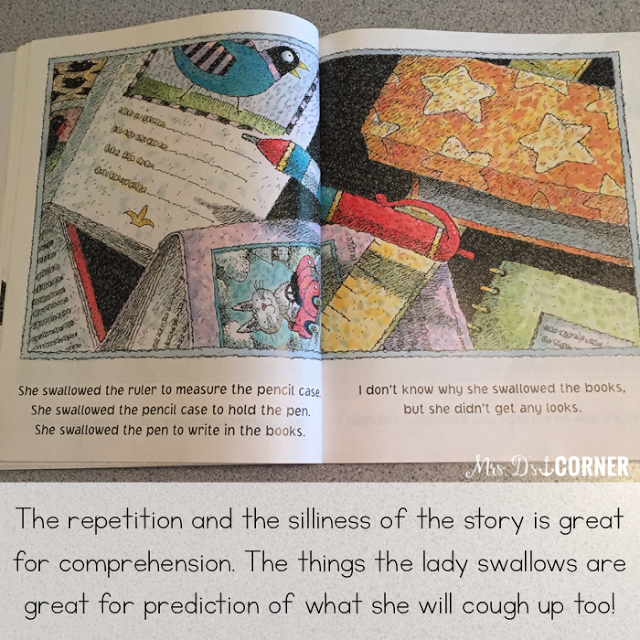 The book is great for practicing so many important reading skills, like sequencing and comprehension. One of my higher level readers will typically read the book to the class, or help me ready the story with the class. As we read the book together, I will model by using the sequencing cards that match the book to sequence the story as we read. If we don’t use the sequencing cards, we are using the Adapted Piece Book Set for the story. In the video above, you can see The Old Lady Swallowed Some Snow! After we read, I will flip through to the pages of the book once again. I give each student a sequencing card or two (or an adapted piece), so they all have to pay attention to what part of the book we are talking about to sequence it correctly as a class. This helps them be more accountable for paying attention, and they help each other out when one student is struggling. We then complete the sequencing card activity again… but only with the pictures from the book this time. We either complete this activity as a class or in centers. It depends on how much time we have, as well as the student’s ability level. My higher level students can complete the sequencing on their own. Depending on our comprehension of the text, we will continue sequencing the cards (or adapted pieces) with and without the book. I use this book to really focus in on First, Then, Next, Last and/or First, Second, Third, etc. to give students the opportunity to really practice using ordinal numbers and words. This is when we use the cut and paste worksheet. 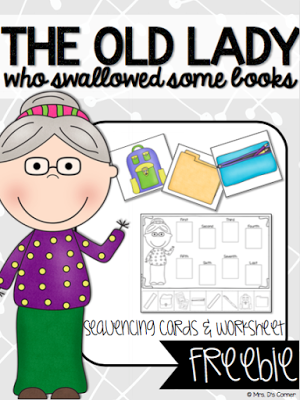 Since I know a lot of elementary teachers own this book, I’m sharing with you a couple of free pages from the Old Lady Swallowed Some Books book companion guide. Follow Stephanie’s board Books Bloggers Love on Pinterest. What is your favorite book to read during the month of August? Tell us in the comments below! I didn't even know this version of "There Was An Old Lady" existed. This looks like such a cute book. Thanks for sharing your freebie Stephanie! This is one of my FAVORITE versions of "There was an Old Lady!!!" So darling. This is so fun reading all of the book recommendations! Thank you for linking up wit us. LOVE this! My 1st graders truly enjoyed it! Easy and fun for the first days of school. Thanks for the freebie!